Soha Ali Khan Makes Being Pregnant Look SO Stylish! 2016 gave us some of the most aww-worthy B-town babies we’ve ever seen. In fact, we still obsess over these little ones every time the internet gives us a sneak peak into their lives. It’s always exciting to know there’s another celebrity couple in line to become the new parents! Yes, you’re right, we are talking about Soha Ali Khan and Kunal Khemu. Not only has the couple taken the internet by storm with their adorable Instagram posts, Soha has proved that mom-to-be style can actually look quite cool! Going by how stylish Bebo was during her pregnancy, it’s safe to say that it runs in the family. Here’s a roundup of Soha’s achievable and elegant maternity style, for the mommy-to-be in your life! Cold shoulder and florals done just right! 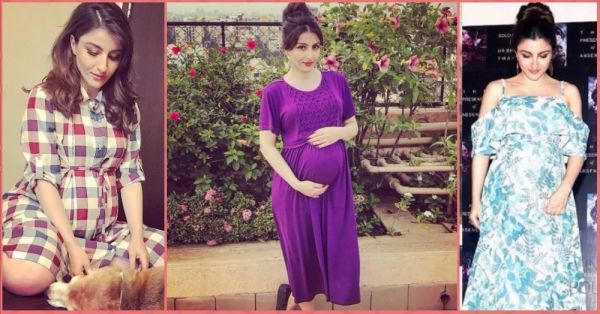 Doesn’t Soha Ali Khan look like a million bucks in her maternity outfits? She’s giving every mom-to-be major style goals! So if you know someone who’s going to become a mommy, get tagging!